There are fields in which marble’s high specific weight can cause some problems. 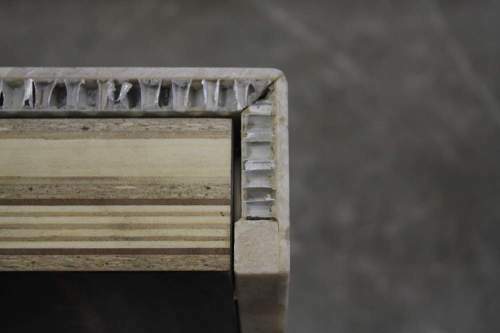 To avoid them, our Company realises lightweight marble components: lightweight marble is a material obtained thanks to a particular processing type through which a thin marble plate is stuck upon a rigid alveolar structure. 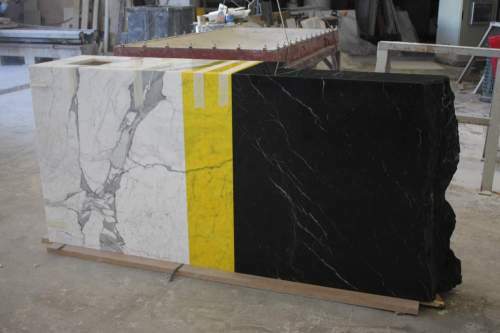 From an aesthetic point of view, you cannot notice any difference between it and a traditional marble detail, while the weight is reduced up to 14 kg/m² and the mechanical resistance characteristics are much improved, so that this kind of marble material is highly competitive compared with others. Backlighting is both a technical and aesthetic solution that adds greater value to some materials, in particular to onyx, which thanks to its macrostructure lets the light gleam even through 20 mm thick standard plates. Onyxes generally do not require particular additional processing types and let the designer concentrate only on the lighting typology he has to apply to the rear: this will be determined by the onyx’s transparency degree, the space at the designer’s disposal and the anchorage procedure. Our Company offers the possibility of backlighting materials such as marble and granite, which normally would not be suitable for this kind of application because of their macrostructural features. 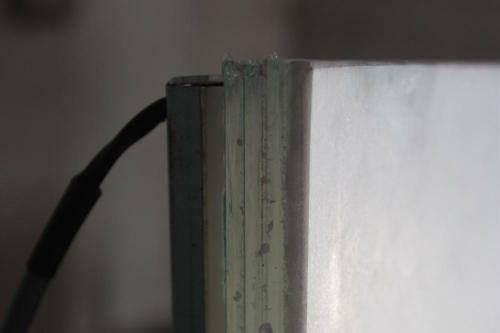 This becomes possible thanks to the gluing processing: through this specific application marble gets fixed upon a glass plate; the result is a compound panel with reduced thickness and great resistance, guaranteed by tempered glass. The employment of thin marble plates (3-5 mm thick) lets the light shine through, so that we can obtain an extraordinary final effect. 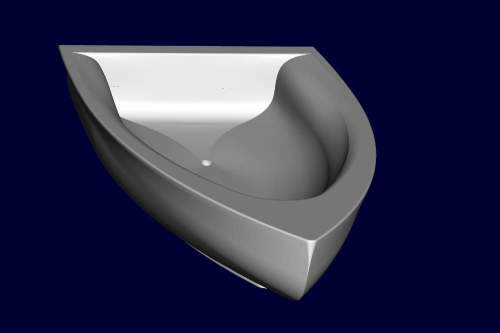 The realisation of marble bathtubs, washbasins and sculptures, except for the handmade finishing step, often requires the employment of machineries with numerical control (CNC), which working with 5 axis can put faithfully into effect each desired element previously designed in a three-dimensional file. Our Company can offer to the customers a 3D modeling service, starting from the paper two-dimensional drawings or engineering a preexistent 3D file, in order to realise the elements and, taking carefully into account the various materials’ characteristics, remove or point out the structural flaws concerning particularly thickness, weight and functionality. Marble colouring can arise in most people a sense of refusal, for intervening in such an invasive manner on one of the natural products par excellence is an unusual operation, which requires a perfect realisation (colour homogeneity, visual contrast without imperfections) and above all clearheaded designers. We should also specify that this kind of processing is not completely new and has its noble origins in the colouring techniques applied by Greeks and Romans onto their marble sculptures, which were artificially polychrome, despite Winckelmann’s theories that have been handed down to modernity. Our Company offers to the designers this further expressive instrument and guarantees, by means of the employment of a particular pigmentation, a permanent and homogeneous colouring and, following our rule, a perfect realisation, essential in this type of application.